Jam was an important element in the diet of those living in the 19th century. Before the 1880s bread was eaten with treacle or syrup because butter was too expensive to be eaten everyday. 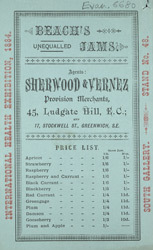 In the 1880s a range of cheap, factory produced jams was introduced, providing a welcome addition to the working class diet. Most of the jams actually contained more sugar and colouring than fruit but they were thought to be more nutricious than syrup; this is illustrated by the fact that Beach's jam is being advertised at an International Health Exhibition.